Some new 3d printers have complex systems that allow them to detect filament feed jams. If your settings aren’t quite right, or your bed isn’t level, or you don’t use high quality filament, a jammed filament will result in your 3d printer making air prints, where the print head keeps moving, but doesn’t extrude any plastic. Long prints can be extremely frustrating when you check in on them, they have ended many layers before they should. If you have a 3d printer without filament feed sensors, here’s how to make your own homemade system to alert you when your filament jams. All you need is a good webcam and some white packing tape or a white out pen. The main idea is to have your computer see when your filament reels stop spinning. Some 3d printers do this with sensors, but since most don’t have these complicated and expensive sensors yet, we’re going to do it optically. Use the tape or white-out on the side of your reel of filament to make strips like spokes on a bicycle wheel. If your filament reel is made of black plastic, use white. If it’s made of a white cardboard, you can just use a black marker to draw spokes. The software needs high contrast. Now you need to install Yawcam, a free webcam streaming software. Follow the instructions to install it on your computer with the webcam attached, and set it up to use your webcam. You don’t need to stream the video for this to work. The webcam should be set up facing your filament reels head on. The spokes of the reel should fill the picture. 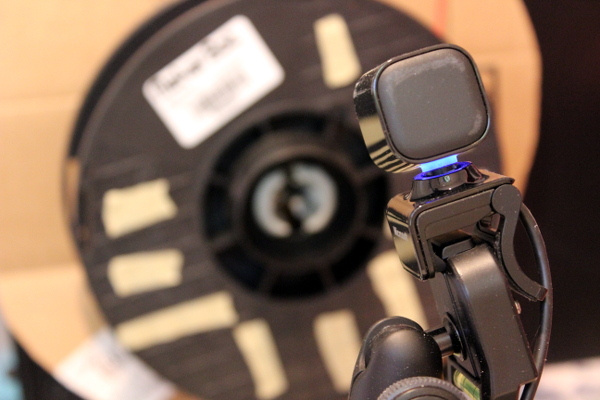 Once you see the filament reel, in Yawcam, set up motion detection. Set the sensitivity very high and the tolerance fairly low. You’ll need to adjust these to your lighting levels and how good your webcam is. In this case, we want the alert to happen when motion stops, so click the checkbox to “invert motion detection”. The interval can be as high as 20 seconds (20000 ms), because you don’t want to get an alert when your printer is just doing small details. Put both a sound alert and an email alert. That way, if you’re nearby, you hear a sound right when the filament jam happens, and if you’re away, you get an email. If you use an email to SMS gateway, you can even get a text when your filament jams. Play with the settings a bit until you’re only getting alerts when your filament actually jams. Now you can wander off while your 3d prints are going for long periods of time and not worry as much about filament jams. If it does jam, just pause the print job, push some more in to get rid of the jam. Make sure your filament isn’t tangled further back too. A nice side effect is that this system detects when your prints stop as well, because your filament will stop then too. With this system, you can get more printing done in the same amount of time, all without wasting your time babysitting your 3d printer.